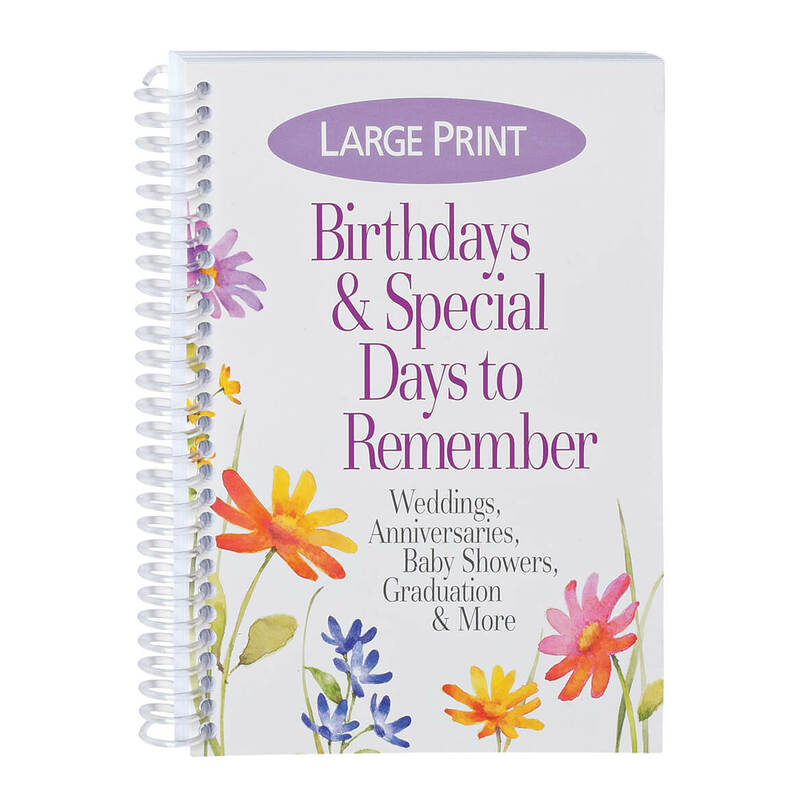 Large Print "Birthdays & Special Days to Remember"
I have so many family members many to keep track of. I never remember birthdays or special days. I chose this book to keep the birthday of loved who I write to alot. This way I never miss their birthday or anniversary or graduations. I have so many birthdays to remember and this is a great way to keep all of those dates organized and handy! I've had one for a long time and it wore out . THERE IS SO MANY DATES TO REMEMBER WHEN YOUR FAMILY AND FRIENDS LIST GROWS. when I AM GONE MY CHILDREN WILL HAVE THIS INFORMATION. I need help getting organized. I needed something so everyone else in my family would have a source of everyone else' s birthday. And this is perfect. For an easy way to remember special occasions. To record birthdays, anniversary and other special events for family and friends. So I don't forget those Special days of Special people in my life. I need to be able to keep track of all the important dates and I think this book will help. I order your (What,s due) books every year for my daughter and myself and we love them. So I won't forget my nices and nephews birthdays. So I can get a jump start on when to buy the cards and get them in the mail. I've been looking for one, since I lost mine. To keep all important dates in one place. Need a new birthday/special occasion reminder. My current book was lost in Harvey, therefore I needed a new one and it is quite helpful to keep me in check. I was tired of making my own reminders. My mom is 93. And needs large print to keep up with 6 children, 16 grandchildren and 23 great grandchildren. Plus spouses. She needs to have large spaces to write in. I saw this in your book and liked it for keeping up with family birthdays etc. I had one a nice hardbound one years ago from Hallmark. You can't find them anymore. Hallmark gives little pocket ones out at the first of the year but I wanted something a little nicer. I had been looking for a product like this for some time and unable to find it in stores. I wish I could see the inside! I will review it after I receive it. It would be very helpful to post some photos of the interior pages so potential buyers could see what they are buying. It says "Each daily grid includes 3 large lines to write in dates," but what does that mean? What does that look like? BEST ANSWER: Thank you for your question. 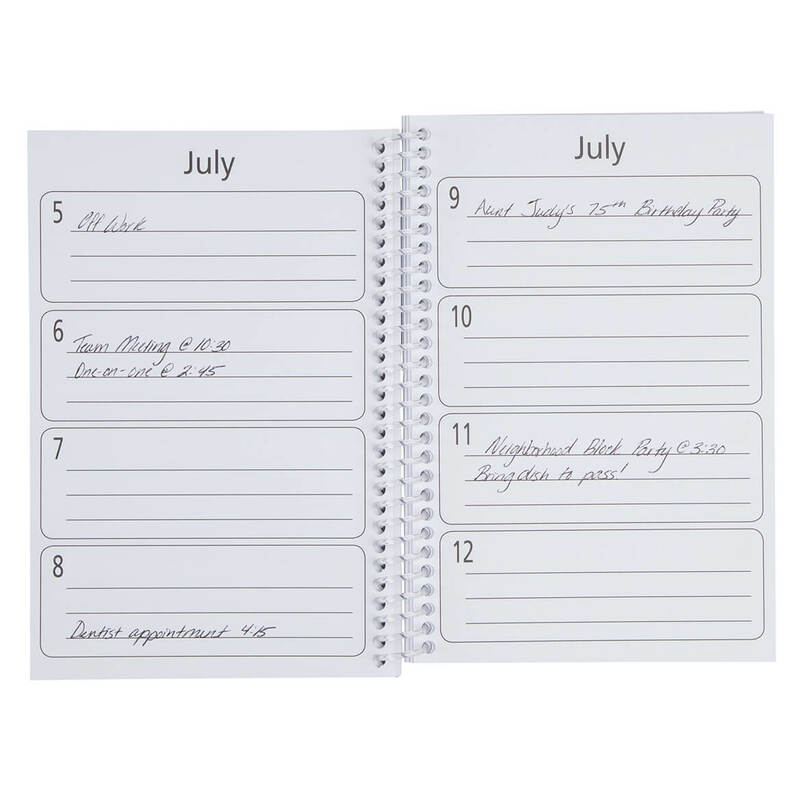 This item is like a calendar, there are grid lines to write the special dates on a specific day. We hope this information will be of help to you.